Once per turn, Wu Guo Tai can choose two characters and switch all their equipment. The difference in the number or equipped items must be less than the amount of health Wu Guo Tai is missing. When any player is on the brink of death, Wu Guo Tai can display one of their hand cards. If it is not a basic card, it is discarded and the target is healed one. Otherwise, they keep the card. "Exposure" can be used to swap the equipment between any two characters so long as the requirement is fulfilled. In fact, Wu Guo Tai can switch her own equipment with that of another character. "Exposure" can be used to forcible take the equipment from one character and re-equip them onto another character who has no equipment. In effect, one of the characters would have zero pieces of equipment and these 'zero pieces' would be swapped with another character who has X or fewer pieces of equipment. The use of "Amend" does not qualify as using a Peach. If Wu Guo Tai saves King Sun Quan with Amend, he does not regain two units of health. Additionally, Wu Guo Tai can use "Amend" during Jia Xu's turn. Because this act does not qualify as using a Peach, it bypasses his "Complete Kill." When Wu Guo Tai uses "Amend" on another character, she picks a card at random from their hand. If Wu Guo Tai uses "Amend" on herself, does not need to choose a hand card at random and she simply selects one of her cards to do the power. Wu Guo Tai can only use "Amend" once per instance that someone is brought to the brink of death. In effect, she cannot 'double dip' and try again if she selects a basic card instead of a non-basic card. Additionally, she cannot try the power multiple times if the character needs to regain more than one unit of health to survive. For example, if someone with one unit of health is Attacked with Wine, she cannot use the power twice to try to heal back two units of health. Remember, basic cards are Peaches, Escapes, Wine, and all types of Attacks. All other cards (equipment and tool cards) can be used with "Amend" to save a character on the brink of death. "Exposure" is a wonderful ability because it allows her to act offensively and defensively. She can strip equipment away from an enemy and give them to herself or an ally. "Exposure" is not only useful for transferring equipment from an enemy to an ally, but it can also be used to switch around equipment within a team. For example, consider a situation where an enemy seated next to Wu Guo Tai has a +1 horse and an enemy on the other side of the table has the Longbow. Wu Guo Tai can force these characters can swap equipment such that the enemy next to her now has the Longbow and the other character (who Wu Guo Tai could not reach anyway) now has a +1 horse. The end effect of this swap in this hypothetical situation is that Wu Guo Tai can now reach the character seated next to her and the enemy on the other side of the table can no longer reach her. Similar situations may exist with Wu Guo Tai and her allies and the power can be used in a similar manner to correct equipment deficiencies within her own team. "Amend" can be used to essentially convert otherwise useless cards into Wine. In Wu Guo Tai's case, she can keep equipment and tool cards in her hand when she only has one hand card to save herself from the brink of death. 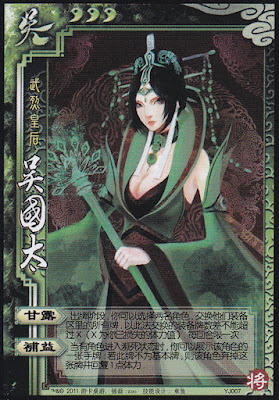 Other characters on her team can save these types of cards if they are low so Wu Guo Tai can save them if they die. The health requirement of "Exposure" can sometimes prevent it from being used in a useful manner during her turn. If Wu Guo Tai is at full health, "Exposure" can be useful sometimes, but it's effect is more dramatic when Wu Guo Tai is weaker. 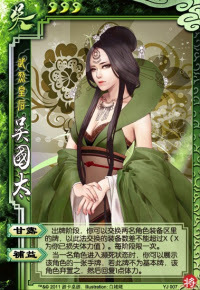 Wu Guo Tai can choose to suffer damage by not responding to Attacks or tool cards like Barbarians, but this can be dangerous if she is unable to heal this damage during her turn. "Amend" is useful for Wu Guo Tai to save herself, but it can be unreliable when trying to save allies if they have multiple cards in their hand when they are on the brink of death. Most players have a natural inclination to keep basic cards like Attacks or Escapes when they are low on health. This rational mentality can hinder the effectiveness of this power. "Amend" may give some Wu Guo Tai players an inflated sense of longevity. While it can save a character from the brink of death, it cannot prevent damage. Wu Guo Tai is an advanced character. Characters who are just learning how to play San Guo Sha will probably have a difficult time managing her powers effectively. Sun Shang Xiang/Ling Tong - These characters have powers that activate when equipment leaves their equipment areas. "Exposure" an be used both to place equipment in their equipment areas and to remove their equipment to activate their abilities. Remember that Sun Shang Xiang's "Armed Consorts" activates once for each piece of equipment that leaves her equipment area and Ling Tong's "Whirlwind" activates each instance in which equipment leaves his equipment area. In effect, Sun Shang Xiang draws two cards for each piece of equipment that leaves her equipped area when Wu Guo Tai uses "Exposure" and Ling Tong can only deal one unit of damage or Attack one character in the same situation, no matter how many pieces of equipment that he loses in one instance. Zhang Chun Hua/Lu Xun - These characters have abilities that dictate a certain number of cards in their hand at all times. One of their weaknesses is that if they acquire cards that they cannot use outside of their turn, they may have trouble surviving until the next turn. If these characters get 'stuck' with non-basic cards, Wu Guo Tai can help them survive with "Amend." Sun Jian/Sun Ce - Wu Guo Tai can help these characters acquire defensive equipment and keep them alive with "Amend" with one unit of health. This makes "Brave Spirit" a lot more powerful. Zhang He/Gan Ning - These characters may only be a minor counter to Wu Guo Tai, but they can still be a thorn in her side by either forcibly discarding the equipment cards that Wu Guo Tai swaps or redistributing them. King Wu Guo Tai seems to be a competent king character. In characters with more than four characters, Wu Guo Tai benefits greatly from the additional unit of health with "Exposure." "Amend" is also a great defensive ability that will keep her alive. Loyalist Wu Guo Tai is a good loyalist pick. She can rearrange equipment cards to give the king armor and +1 horses and to keep long-range weapons away from rebels who are far away. Additionally, "Amend" will help keep the king alive. Rebel Wu Guo Tai is also a good rebel pick. She can strip the king of his equipment and empower a rebel at the same time. Spy The spy role is not Wu Guo Tai's best role as she is mainly a team player, but she seems to handle this role better than many other characters do. Both of her powers can be used to keep the both sides evenly matched. However, she may have trouble in the one-on-one battle if the king is strong and she is weak. Wu Guo Tai is one of the standout characters of the first fan-made expression. Always remember to take into account all possible uses of "Exposure" during your turn before equipping your own equipment cards. If there are no good options, you may sometimes consider keeping a low profile and keeping equipment cards in your hand. It is sometimes a good idea to intentionally take damage from tool cards like Barbarians and Hail of Arrows to make "Exposure" more powerful, but weigh this option carefully.